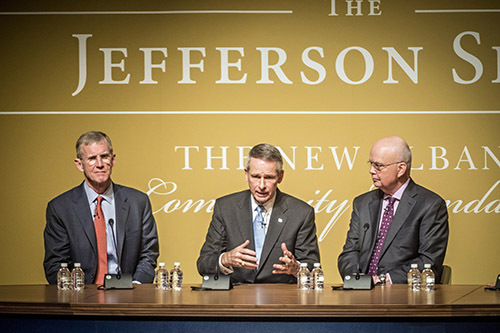 On February 1, 2018, The New Albany Community Foundation convened onstage together for the first time General Michael Hayden, General Stanley McChrystal and General Peter Pace for a national security panel discussion moderated by CNN’s Dr. Fareed Zakaria. With more than 100 years of service and 12 stars among them, the conversation provided rare insight into American foreign policy, national security and global affairs. The event, which sold out in record time, also hosted over 100 veterans, active-duty service men and women and ROTC, seated onstage, to hear the Generals captivate the audience with a stimulating, provocative conversation based on their collective experience and insights. The evening’s discussion was timely as well, as central Ohio and the nation look forward to the opening of the National Veterans Memorial and Museum this summer on the Scioto peninsula in downtown Columbus. As one of the evening’s sponsors, NVMM will recognize the sacrifices of those who serve or have served as well as veterans’ families. Zakaria skillfully guided the Generals through topics such as the United States’ role in the midst of shifting global politics, Russia’s intentions and interference in the 2016 Presidential election, China’s rise, President Trump’s handling of North Korea, the Iran nuclear deal and more. Zakaria encouraged the audience and the speakers to treat the discussion as if it were a National Security Council meeting, providing context to the discussion.